So much for my titling today’s walk ‘Spring Awakening’, apart from a load of raucous blackbirds there was little to make one think of spring and a cool and damp morning wasn’t setting much of a mood either. We started at Grace Salmon Park in Westport but without much sign of egrets or the shorebird or two that I had hoped for. OK there were a couple of Killdeer but it’s a stretch to think of them as shorebirds as they are seemingly just as happy mooching about on gravel parking lots at the Wilton Market as they are anywhere else in the world. The only birds of ‘note’ were some Pine Siskins, but after this year it’s hard to think of them as uncommon within the state. Next stop was a quick one at Compo Beach where we were surprised by the sheer wealth of waterfowl on show. There were a number of large flocks of Greater Scaup (I pointed out identification of the wing pattern to the group when the birds stretched their wings), hundreds of milling Long-tails and good sized numbers of many other species such as Red-breasted Mergansers, Horned Grebes and Brant. The pick of the gulls loitering offshore was a ‘Kumlien’s’ Iceland Gull which gave the group a good session on identification. Many of the group found the apparent darkness of the primaries surprising for a ‘white-winged’ gull although the name seemed more appropriate with nice flight views. We also went over the theories as to whether the gull is a subspecies or hybrid – answers on a postcard please gull experts. A brief explanation (here), at the present the AOU treats Kumlien’s as as a subspecies of Iceland Gull. Over at Sherwood Mill Pond the ducks continued to impress with a large mixed Wigeon/Gadwall flock (no sign of the Eurasian). Sherwood Island itself was pretty quiet apart from offshore where a few flotillas of Red-throated Loons and Horned Grebes as well as continuing ducks, many just offshore, were pretty impressive. The cool air and glassy water made viewing conditions almost perfect apart from a little fogginess further out. The only other bird of note a Greater Yellowlegs that certainly appeared to be a recent migrant arriving from the south as it circled the marsh for a while deciding where to put down. A quick coffee break (at which we added a calling Red Shouldered Hawk – right over Rt 1) and a few more spots and more waterfowl (I wonder if I am the only birder who has fantasized about one day birding the length of Rt 1 on one long crazy road trip – David Sibley meets Jack Kerouac style). Although we’d had some excellent views of some nice birds the tour would have not been the same had it not been for a fortunate spot as we explored a couple of local cedar/pine stands. 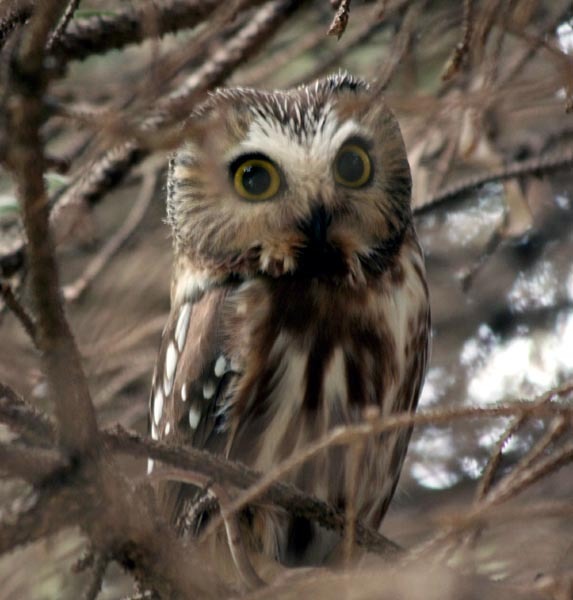 I spotted a few large splashes of telltale whitewash and as I followed the wash up the branches there was perched a cute little Northern Saw-whet Owl. At 8 inches this really is one super cute little bird. As I’ve said before it’s always a thrill to find these birds and the first flash of those little eyes as you spot them gives one an unbelievable rush. The group all had great looks at what was a life bird for a few involved and a treat for everyone. The group all took turns to have a minute or so with the little beauty and after a few memento shots we left him to his morning snooze.